As Dean and Sam Winchester (Jensen Ackles and Jared Padalecki) prepare to embark on their sixth season of Supernatural, there’s something brewing in Japan. 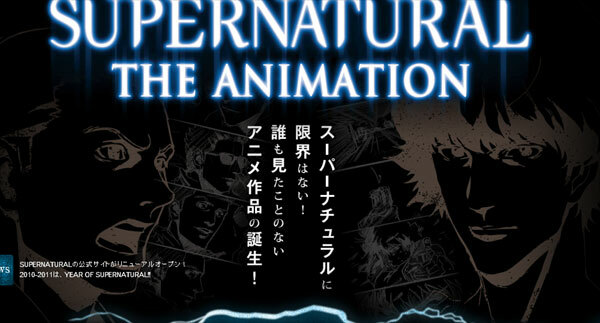 The Japanese division of Warner Bros. has a website up for Supernatural: The Animation, a 22-episode series from Madhouse (Batman: Gotham Knight, Death Note). Warner Home Video is aiming to start releasing these in Japan on January 12, 2011. No word yet on the U.S. release. This entry was posted on June 11, 2010 at 12:43 and is filed under Anime, Supernatural with tags anime, brothers, deathnote, Supernatural, winchester. You can follow any responses to this entry through the RSS 2.0 feed. You can leave a response, or trackback from your own site.